TouchVPN is a free VPN that recently made its appearance in the industry. 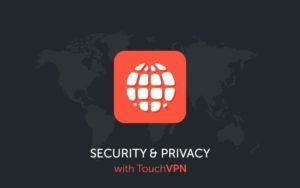 While the chance of having a VPN service that protects your data without a cost is very tempting, there are many downsides that you should be aware of when you use a free VPN like TouchVPN. For instance, you should know that there is not a lot of information available. This is one of the reasons why you may question the legitimacy of this service. In spite of the concerns that you may have, the truth is that TouchVPN is a legitimate service, but since it is still relatively new and the company is small, it is likely that it doesn’t have the resources to suit the needs from all its customers. Here is more about TouchVPN. TouchVPN focuses on supporting PPTP protocol. The problem is that this is a weak protocol that has been already cracked. OpenVPN on the other hand is a solid VPN protocol that is known for its reliability and security. The good thing about PPTP is that it is fast and it is supported by most systems, but apart from that, it is not a good solution to consider. In terms of privacy, it should be said that TouchVPN is not a good choice and it has not implemented a logless policy, meaning that it can still keep track of your activities and data. It keeps logs of your IP address, name, email address and more. Still, it doesn’t keep track of your private information, unless it receives a request from authorities. TouchVPN supports Android and iOS, which means that you can enjoy a high level of protection for your internet traffic, even if you are on the go. The download and installation process is simple and there are practical links available on the official website. There is also a Chrome browser extension available. However, running the VPN on Windows is not that simple. You won’t find a client for Windows, which means that if you want to run the service on this platform, you will have to set up a new VPN connection through Windows and Internet settings. You will have to follow the process manually using the instructions and information on the website. After completing the setup, you can simply establish a connection or disconnect with a single click. The interface for the mobile apps and the Chrome extension are quite appealing and they can e navigated easily. You won’t come across complex settings and you will be able to connect without issues. TouchVPN is a good choice for beginners since it is very easy to use. You will be able to enable the app and to select the server you want to connect to, without any problem. When you opt for TouchVPN, you get access to a selection of servers located in United Kingdom, France, United States, Denmark, the Netherlands and Canada. However, it is important to keep in mind that not all of them are available on all the devices that you use. If you are a Windows user, you can only connect to servers in the United Kingdom and the United States. Although at first sight, TouchVPN doesn’t offer much in terms of features, the truth is that it offers smooth performance. You won’t be amazed by its speeds, but they are good enough to help you to stream content in any video resolution. Since TouchVPN is a free service, you won’t find a great deal of features. The service is focused on helping users to bypass content from anywhere and you can get a strong level of protection for your privacy and online security. Unfortunately, the service doesn’t support P2P, so if you are looking for a VPN that allows you to enjoy a safe downloading experience, TouchVPN is not the right choice. That being said, the service is very easy to use and it works smoothly. VPN is a practical solution and it offers more than just general VPN protection. TouchVPN supports PPTP, meaning that it can be easily used on most devices that can handle this protocol. You will be able to use the service on tablets, computers, routers, game consoles, smartphones and more. Although you can set it up on Android, iOS and Windows, TouchVPN is not available on Mac. While this is disappointing, it is possible to use the service on as many devices as you want and there are no bandwidth limits imposed. TouchVPN is completely free and there are no options to upgrade to a premium version of the service. However, if you use the service and enjoy it, you can donate and support the further development of the service. Still, the service falls short in terms of features so you won’t get a great deal of features. You can only reach out to TouchVPN via email. You may have to wait some time to get an answer, but the responses are professional and friendly. However, it is disappointing to see that there is no live chat available. Plus, the website doesn’t offer a great deal of information that could help you to use the service. Since the service is free, it is not a big surprise to see that they don’t the highest standard of customer support. TouchVPN can be used for free and it offers an effective way to get around censorship and blocks. However, the service lacks advanced features and it doesn’t provide high speeds or strong security. You can connect to a limited selection of servers and the level of encryption used is not that strong. That is why, if your main concern is to add security to your connection and to safeguard your privacy, the best thing is to look for a different solution. TouchVPN may be practical to overcome restrictions when you access websites, but it is not a good solution for privacy protection and anonymity.